Home Learning Center Basics MC4 connector crimping tool: how to use? MC4 connector crimping tool: how to use? A MC4 connector crimping tool or crimper is a very common tool used for creating quick, solderless contacts in and outside the workshop. Crimping tools are also called wire crimpers, or crimping pliers because simple crimping tools somewhat resemble the common pliers. A crimper is used to joint two metallic ends, e.g., a connector to end of a cable, or a cable to a cable. The crimp action involves the deformation of one or both pieces to be joined so that a firm contact and grip is obtained. An example is the image below. After using the crimping tool the wire can then be attached to a MC4 connector, etc. The wires in question will normally be multi-strand wires. Single strand wires are not amenable to a good grip and contact. A good crimping tool will also have guides for correct relative position of the wire and the connector for crimping. Crimpers are available for crimping single connector cables, as in electrical power devices, or multi-connector cables, as in data and communication cables. Crimping tools are also available for coaxial cable connectors also. Crimping tools are particularly useful in the solar PV work. Crimpers should be used off-line. The cushion grip over the metal parts is for comfort and not for electrical safety. Easier, simpler, quicker, and often cheaper connections. Avoids possibly toxic or harmful processes which need special environment and equipment. In comparison, soldering requires rigorous cleaning, heat, and will release fumes. Mechanically superior connection because of strain relief and no solder wicking. Crimpers may be plain simple crimpers for a single contact at a time, or may be complex multi-function types. 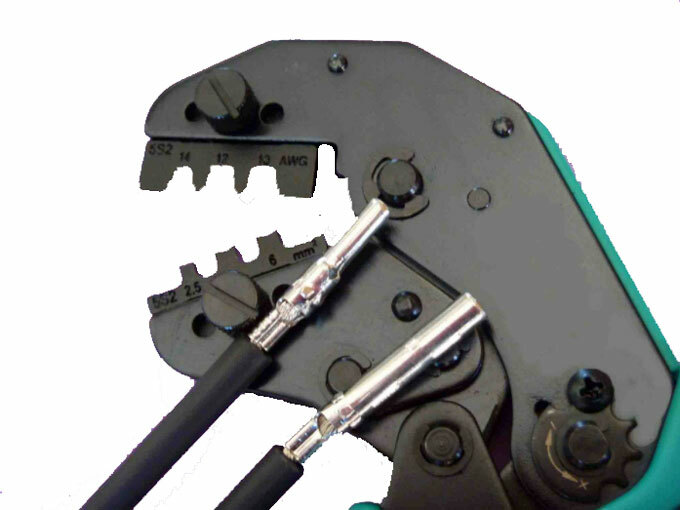 Crimping tools are available for handling connectors of types: BNC, DIN, RF, Fiberoptic, telephone, RJ, D-sub etc. Multifunction crimping tools combine the crimping function with the functions of wire cutters, or wire strippers. In some designs for specialized functions a screw cutter may also be present. Crimpers meant for thick wires may have a die and anvil. The work piece is held sandwiched between the die and the anvil and the die is hammered to form a crimp. Ratcheting type crimpers hold the work piece and do not release it until a threshold pressure is applied. A safety mechanism may be available for the operator to release prematurely. Ratcheting crimpers can also have a provision for interchangeable dies. This permits use of the same tool to crimp different types and sizes of connectors. Hand-held manually operated-These are portable, and inexpensive, typically having interchangeable die-sets. A ratchet crimper could yield up to 180 crimps per hour. Hand-held Hydraulic– Although manually operated the hydraulic principle reduces the need for force. Hand-held Electric– These are battery powered and will provide a more consistent and faster crimping process. Bench–top Manual– This type of crimper would be used for heavier work, and will have along handle to reduce the need of force. It will offer a lower crimp rate but will offer consistency. Bench–top Electric– Will provided a greater crimp rate with good quality and consistency. Mountable Hydraulic– These are for very heavy work. The method of operation will depend on the job and the tool chosen. 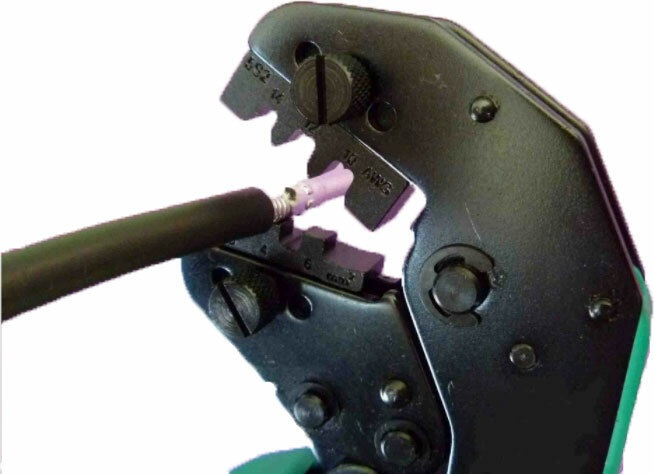 Assuming a basic crimping tool, the following steps are required in attaching a connector to a wire. Get the wire and a connector as required. A connector is never to be reused. Strip a suitable length the wire end. The length will depend on the thickness of the wire as well as the size and type the terminal. Ensure both the wire end and the connector are clean where they are going to mate. Insert the wire into the barrel of the connector. The end of the wire should come just in line with the terminal end of the barrel. Place the wire and the connector in the jaws of the crimper, and apply, after taking a second look to ensure the wire and the terminal are correctly positioned with respect to each other and the crimper jaws. Release the jaws and inspect the crimp or quality.